There was an extremely upsetting halachic responsum which appeared in last week's Yated Ne'eman. It was all the more distressing because it was quoted in the name of Rav Zalman Nechemia Goldberg, who is generally respected as a very wise and sensible person. In his defense, I will point out that we have no idea as to the framework within which the question was presented and answered - whether the questioner sat with him to discuss it properly, and Rav Goldberg wrote the answer, or whether the questioner grabbed him after mincha for a few seconds, gave him the bare outline of the question, and "processed" the answer. The son is told that he can disobey the wishes of his dying father and give the funds instead to a cause that his father did not want to give to! Here's the crux of the problem (and I confirmed this with a Posek who specializes in wills, Rav Menachem Copperman): The answer does not deal with the difference between the letter of the law and the spirit of the law. Or, as the Posek that I consulted presented it: The answer deals only with what one is absolutely legally obligated to do, not with what is the right thing to do. According to the letter of the law, it is indeed true that such a dying wish is not legally binding, since it does not fulfill the various technical requirements. 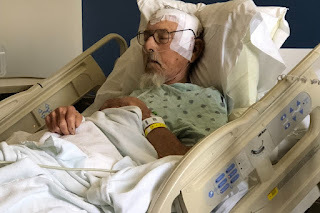 However, there is still a principle that it is a mitzvah to fulfill the wishes of a dying person, especially in a case where it is grounded in the fundamental principle of kibud av, honoring one's father. As Ramban notes, the Torah says V'asisa hayashar vehatov, one should extrapolate from the Torah's general principles to do the right thing in a case which is not technically covered by the law. "A person should accustom himself… to respect all creatures, since the perfection of the Creator, Who formed man with wisdom, is recognizable among them – likewise the wisdom of the Creator is in all creatures. He should demonstrate for himself that they are very, very precious, for the Creator of everything, the Elevated Wisdom, takes care of all creatures. If he were to disdain them, Heaven forbid, he is encroaching on the honor of their Creator. It is similar to a master craftsman, who made something with great skill and showed his work to people, and one person begins disparaging it and treating it disrespectfully – the craftsman will grow very angry, for by disparaging his handiwork, they are disparaging him. So, too, the Holy One; it is evil in His eyes if any of His creatures are treated disrespectfully. This is what is written, “How great are Your works, O God… You made them all with Your wisdom” – since You used Your wisdom, Your works are important and great, and a person should contemplate the wisdom in them and not disdain them." I can certainly understand the frustration of not identifying with the charitable cause that one's parent has chosen, but that is the essence of honoring one's parents - fulfilling their wishes even when it's hard for you to do so. Imagine if a secular newspaper printed an advice column in which the dying father is an Orthodox Jew with a son who has become Reform, and he asks for his charity to go to an Orthodox Jewish day school rather than a Reform school, but the son is advised that he knows better and he should give the money to a Reform school instead. Can you imagine the reaction in yeshivah circles?! UPDATE: A number of people suggested that this has to be evaluated from the perspective of both the questioner and the rabbi that the deceased would greatly benefit from the redirection of the funds, and that surely his neshamah now wants such a thing; and thus from this perspective, it is ethically appropriate. I think that there is some merit to that argument, and I would like to hear what others have to say about it. To my mind it still demonstrates a certain lack of humility, the same sentiment that leads people to censor the works of deceased Torah scholars on the grounds that "now that he is in the Olam Ha-Emes, he surely regrets writing that." I do not understand the teshuvah. It is pretty clear that מתנת שכיב מרע and מצוה לעשות דברי המת are two separate things, as the latter applies to instructions given when the departed was entirely healthy. See also Choshein Mishpat 250:23, 252:2. While there are opinions that מצוה לעשות דברי המת only applies when there is someone specifically charged by the deceased, when he gave a third party money (eg) and told him who to give it to after his passing. However, both the Rama and the AhS (and I assume the proverbial "anyone") holds that without such a specific charge, the obligation would go to the inheritors. But in any case, your outrage is over the fact that R' Zechariah Nechemiah Goldberg assumes the father's soul would now be happy supporting Torah study, and you assume his priorities didn't change. For that matter, your language of "a cause that he'd support" puts a subjunctive in there as though the father's soul isn't still making such judgments, and we're only talking hypothatically. "your outrage is over the fact that R' Zechariah Nechemiah Goldberg assumes the father's soul would now be happy supporting Torah study, and you assume his priorities didn't change. For that matter, your language of "a cause that he'd support" puts a subjunctive in there as though the father's soul isn't still making such judgments, and we're only talking hypothatically. " And here you've hit on the crux of the problem. Rav Zalman Nechemya said or wrote that it will certainly benefit his neshama to distribute to a worthwhile cause. Slifkin did not address this point at all. And I'm sure Slifkin doesn't believe it at all. So of course he takes offense. I imagine that ultra-rationalist Slifkin doesn't believe in the existence of a soul after death. So of course the father's priorities didn't change and of course the father's soul isn't making judgments anymore. Very audacious on your part stating, with certainty, what R' Slifkin does or does not believe. You are probably (not certainly) one of those people who believes that the 'soul' of the deceased move up to higher rungs on the heavenly ladder with every recitation of kaddish or psalms, especially if recited by pious free-loaders for a significant donation. Shas is replete with similar incidents, or other incidents that raise one's eyebrows over the ethics of them. They are indeed troubling. The traditional way of dealing with them is either to ignore them, or come up with some sort of unconvincing terutz to explain them away. Of course, all this is for public consumption. There are many scholars who privately, to their closest friends or (in bygone times) to their diary, would admit to finding them troubling. That distinction is, or was, a common part of life: Defending things to the public, but recognizing problems behind closed doors. This distinction is eroding today, primarily due to technology, which has caused people to think they must share with the world every stray thought, what they had for breakfast, and their opinion on everything and anyone. Wouldn't the world be a better place if those scholars of bygone times had voiced their thoughts publicly ? Someone with a true sense of not just kibud av v'em but also gratitude for all that his father did for him would never ask this question in the first place. Therefore we're back to Chazal's statement in Bube Maaseh 1C: a stupid question begets a stupid answer. Let me come to his defense. 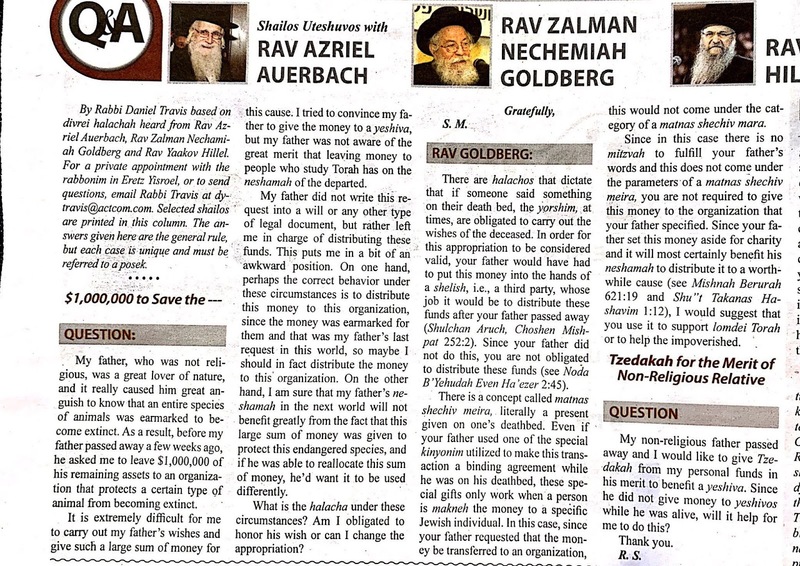 The attitude of both the questioner and Rav Goldberg is clear from the article: The father was terribly mistaken, and now in the world of truth his soul is crying out in regret and wishing and hoping that the son will disregard his foolish wishes and donate the money to a yeshiva. From this premise, the logical conclusion is that the correct and indeed ethical and kibud-av-fulfilling thing to do is to donate the money to a yeshiva. Your bone of contention here should not be with someone's supposed "lack of basic ethical principles", but with the original premise. Hashem is in charge, and we should leave it up to Him. Of course He gave people bechirah to destroy parts of His creation with their bad behavior, but this only applies on an individual level - individual elephants killed for their ivory or individual rhinoceros for imagined medicinal qualities. Organisations dedicated to eradicating illegal hunting might indeed be worthy causes to donate to (though not nearly as worthy or soul-benefiting as a yeshiva). But the loss of an entire species is a big enough event that Hashem would not let it happen if He still had a use for that species. He does not lack ways to create favorable conditions for the continued survival of a species He wants to survive. You may disagree with this point of view, but it is only an extrapolation of similar lines of thought which every religious Jew must agree with. A mad despot is trying to develop a nuclear weapon big enough to destroy the entire earth. Should we try to stop him? Should governments invest money in a defense system to protect the earth from large meteors whose impact might precipitate an ice age and destroy all or most living things? From an atheistic point of view these are legitimate concerns, but they should not be concerns for chareidim, or even for any religious Jews. For someone who believes that Hashem created world for a purpose, and that that purpose involves Mankind in general and the Jewish people in particular - the coming of the messianic age in which all will recognise His kingship - it is simply inconceivable that He would allow such a monumental upset to His plans. Now it is up to you how far and to which phenomena to apply this argument, but I can certainly understand people who would say the same thing about extinction: Hashem created all animals for a purpose (to serve mankind in some way, either directly or as inspiration for something etc.) and the loss of an entire species is too monumental for Him to leave it to the bechira of people. It can only happen when Hashem decides it should, for reasons known only to Him. Similar arguments apply to global warming. The epic amounts of history -altering mayhem and destruction predicted by some as the consequence of rising sea levels and changing weather patterns can be legitimately seen as the kind of thing Hashem would not leave up to our bechira. It will happen if He wills it, and if He doesn't He'll find some way to stop it, regardless of what we do. Of course this global point of view does not absolve each individual from his personal obligation to appreciate and care for each bit of Hashem's creation that he personally comes into contact with. 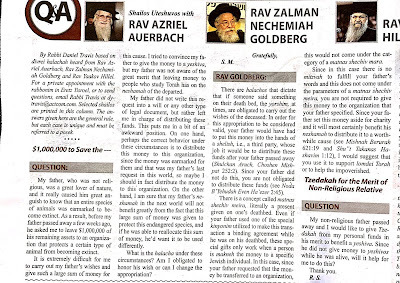 "The attitude of both the questioner and Rav Goldberg is clear from the article: The father was terribly mistaken, and now in the world of truth his soul is crying out in regret and wishing and hoping that the son will disregard his foolish wishes and donate the money to a yeshiva. Your bone of contention here should not be with someone's supposed "lack of basic ethical principles", but with the original premise." 100% on target. but I imagine ultra-rationalist Slifkin does not want to say straight out that he doesn't believe in the existence of a soul, so this confuse post is what we get instead. JoMorris, you raise a good point, which I hope to address in a future post. For now, let me point out that it's this kind of logic which leads to the censorship of seforim - "now that they are in the Olam Ha-Emes, they realize that what they wrote is incorrect, and they would be happy with me changing it." I would also like to stress that the ethical idea of respecting a father's wishes is not even mentioned in the article, not even to explain why it's not relevant.
" let me point out that it's this kind of logic which leads to the censorship of seforim - "now that they are in the Olam Ha-Emes, they realize that what they wrote is incorrect, and they would be happy with me changing it."" What a faulty and disingenuous comparison! There is obviously a huge difference between saying that you know better than X Gadol/mechaber sefarim did when he was alive, versus saying you know better than the layman father who clearly cared little for Torah. come on Nosson, just come out and say straight out that you don't believe in the existence of the soul. It will save us all a lot of trouble. "Now it is up to you how far and to which phenomena to apply this argument, but I can certainly understand people who would say the same thing about extinction: Hashem created all animals for a purpose (to serve mankind in some way, either directly or as inspiration for something etc.) and the loss of an entire species is too monumental for Him to leave it to the bechira of people. It can only happen when Hashem decides it should, for reasons known only to Him." Hashem better make up His mind soon then, because for sure for the majority of observant Jews, these issues are not worth consideration. We stand on the brink of earth's implosion and these are the facile answers if Judaism. Certainly not. And that sort of logic is very worrying. Unfortunately I suspect that too many do subscribe to such reasoning. A mad despot is trying to conquer the entire earth and wipe out every Jew on the face of the planet. Should we try to stop him? Oh, wait. That already happened, and while he was not entirely successful from his point of view, he was far too successful from mine. And everyone who tried to stop him has lives that are owed to them. Conversely, anyone who did not has much to answer for. So yes, that despot can develop his bomb and do a hell of a lot of damage. Or that meteor can destroy a lot of lives. And yes, we as a collective should take all these possibilities very seriously. Also remember that according to chareidi chronology we are currently in year 5779 of 6000, after which Hashem will destroy this world anyways and create a new one for the tzadikim (according to Ramban, Ramchal etc.). Yet another reason not to worry about long term global warming, pollution etc. After all, how bad could it really get in merely a bit over 200 years? @JoMorris: "yet another reason not to worry about long term global warming, pollution etc. After all, how bad could it really get in merely a bit over 200 years?" Are you trolling here or simply a reflection of a form of messianic nihilist hatred? I can't speak for Rabbi Slifkin, but I don't believe in souls. Of course we should try to stop people who are trying to kill us one by one (or trainload by trainload), because we don't know how far Hashem might allow them to proceed, even if we know He won't let them succeed totally. This is what the jews did in megillas esther, with a combination of hishtadlus and prayer. But cataclysmic events with an irreversible effect such as an ice age or destruction of the earth, and also - by extension, but on this you may disagree - the death of the final animals left in a particular species, are things we don't have to worry about. An Ice age would not kill all human beings, neither would the vast majority of meteorites, nor most neuclear wars. Your argument assumes a binary situation, but in general situations are not binary (you have failed to give any). Wit regards to extinction, firstly plenty of species have gone extinct. Are you suggesting that nothing anyone could have done would have prevented any of these? That seems pretty fatalistic. All of this without even pointing out that the entire argument is flawed from the start. No matter the situation, it is silly to use the logic that I should do nothing about it because it is in the hands of Gd. As Mordechai said to Esther "כִּי אִם-הַחֲרֵשׁ תַּחֲרִישִׁי...". JM I certainly hope your statements are expressed tongue-in-cheek as in Swift's Modest Proposal. Perfect example! As Mordechai said to Esther: "If you keep quiet at this time [because you think you personally will be safe in the palace], then relief and salvation will arise for the Jews [as a whole] from another place [because Hashem certainly will not destroy the nation], but you and your father's house will be lost [you will not be among those saved as punishment for not trying to save as many as possible by interceding with the king]." Yes, *and therefore you should do your best to stop this genocidal maniac*! According to you, Esther should have answered "I'll do what best serves me, and happy to leave it to Gd to find some other way of saving the people". The essentially identical argument can be made in answer to any of your points above. If you don't do what is in your power to stop (this species going extinct / this despot blowing up the world / environmental disaster / whatever) then relief and salvation will arise for [whatever the situation is] from another place [because Hashem will do whatever He pleases], but you and your father's house will be lost [you will be punished for not trying to do as much as possible by trying your best]. I am sure the questioner and Rabbi Goldberg both believe the father would have changed his mind now, and I think another reason behind the Psak is that according to the halakha, the money now belongs to the son, and therefore it's not advisable to make him feel he throws huge sums of his own money for his father who wont benefit from it, instead of doing something helpful. That being said, my personal opinion is also that the risk in such a psak is too great. We can definitely not judge other people's matters in their stead, no matter the stakes, and I would say the same thing if we were speaking of donating to the Catholic Church. What about Chizkiyahu's father, Menashe? Well, what about him? Only in the Olam Haemes will WE know if our worldview was right, let's not forget it. In your typical way you have had a strong emotional reaction to something then proceeded to fashion off the cuff "principles" and find sources that match your emotions. How swayed by emotions must you be to attack Rav Zalman Nechemia Goldberg as being unwise and unsensible in his psak simply because it bothered you on an emotional level. "Surely the right thing is for this person to honor his father's dying wish." You are so transparent. All of a sudden Midrashim are quoted, Tomer Devorah is quoted, the spirit of the Law is of foremost importance....etc. "but that is the essence of honoring one's parents - fulfilling their wishes even when it's hard for you to do so." It is also the essence of obeying G-d! In what POSSIBLE way is giving to an environmental cause and not a Yeshiva 'disobeying' Hashem? When you are an ignoramus and argue or decide halacha it is worthless. When you decide or argue halacha through a jaundiced eye it is meritless. When you have both together it is despicable. The Rambam was opposed to giving money to Yeshivas? They did have Yeshivas in his days and they were supported financially. I was under the impression that once a person is niftar, there is no more chance to modify their character? If someone died with the opinion not to give to a yeshiva, wouldn't they stay that way 'upstairs'? It's an outright Gemarah "brah m'zakeh abba"
A son will continue to bring merit to the father even after he has passed on. Yes, absolutely. See Gemarah in Rosh Hashanah regarding what happens after the neshama has been "cleansed" in Gehenom. The soul can than merit "being with God". Apparently, his level notched up after he was purified. "Brah karah d'avuha" the Gemarah seems to see the son as more than just providing merit for the niftar - rather as an actual continuation of the father's legacy. We learn from the story of Hillel not being able to afford the tuition of Shemaya and Avtalyon's Yeshiva and therefore going on the roof to hear the Torah lecture that Yeshivas received money before the title Rabbi was even given anyone. 1. So was Hillel behaving properly by bypassing the guard? 2. So we see charging for admission is perfectly fine. What we see from the Hillel story is that there was tuition. It seems that there was no fundraising for teaching people who could not afford it. Reminds me of Mormon baptisms for the dead. I think it is presumptuous and arrogant to assume anything about what someone wants after their death. This is why people need to have wills, trusts etc: so that when they pass their wishes have a better chance of being fulfilled. Anyway, it is not surprising the Rabbi decides give the money to Yeshiva, it helps perpetuate the religion. But what happened to honor thy father ? Or misleading him ? Or lying to him ? Or breaking your word to him ? a) It make any sense to refer to the neshamah "wanting" anything? b) Even if that is not the case, the Rambam limits merging with the Agent Intellect (Olam HaBa) to a small number of people who have made a close connection with the Divine during their lifetimes. The vast majority of us never make it, so the issue of the neshamah's current wishes is probably irrelevant. Perhaps we can solve the problem of what the deceased father really wants by having a seance and asking him. LOL Probably not necessary since so many already know and don't hesitate to tell us ignorant fools. 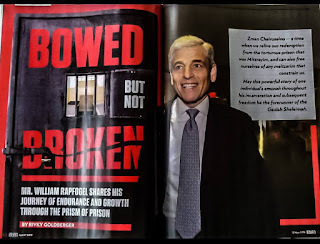 Whoever put together the responsum, unlikely that it was R Goldberg and that he likely had little to do with any of it, has found a way to perfectly fit into what is called a "naval b'reshut ha'Torah".